If James Bond wants to communicate in an ultra-secure way, he might consider utilizing molecules in the future! The laboratory of Professor M. A. R. Meier from the institute of organic chemistry at KIT (@AK_Meier) recently introduced a secret communication system based on so-called molecular keys (https://rdcu.be/LkgH). The basic idea to communicate via chemicals can be found in nature, e.g. in pheromones, and was also exploited previously in secret inks. However, in the present work, the authors report a fully synthetic system based on multicomponent reactions (namely the Ugi four component reaction). The molecules are employed as hidden “passwords” for the decryption of confidential messages or data contains of any size. In principle, every given set of data can be encoded independently using a secure algorithm and the respective password is encoded into a molecular key. Today’s cryptography algorithms can be considered as unbreakable (with the current computing power), but in many cases the password is the most vulnurable part of the whole system. You now might remember those annoying messages from your E-mail provider asking you to change your password. And if you do so, in many cases the following messages appears: Your password is not secure enough, not long enough, contains to less capital letters, special characters, etc. But if you decide to hide your biggest secret, you do not want to worry about the password anymore and can now choose a molecular key. Transportation of the molecular keys was achieved in different media, for instance adsorbed onto paper, coffee, tea, sugar but also by dissolution in perfume, etc. In order to reisolate and purify the molecules and later capture the password, each molecular key is equipped with a perfluorinated sidechain allowing F-SPE purification (chromatography based on perfluoro specific interactions, somewhat comparable to a Teflon® nonstick coat). After isolating the molecular key, highly sensitive mass spectrometry analytics (tandem-MS) in alliance with a specifically programmed computer script determines the chemical structure of the molecular key and hence the password information. Admittedly, this might get a bit demanding and maybe too much for your private secrets, but since James Bond and his team deal with top secret documents they might give the system a try. In their publication, the authors further included several examples of encoded messages and a protected file container (along with the respective encryption/decryption script). 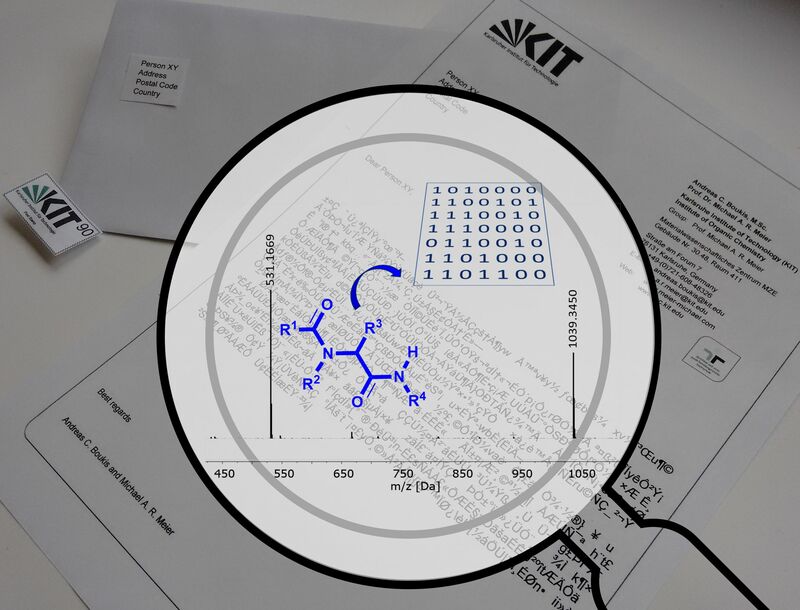 The reader can now try to solve the molecular puzzle and determine the password required to obtain the hidden information.